» What Happened to You, Jimmer Fredette? What Happened to You, Jimmer Fredette? What the hell happened to Jimmer Fredette? When the Sacramento Kings selected him with the 10th pick in last year’s NBA draft, scouts projected a range of NBA futures for the Naismith Award winner: He could end up a starter, an elite sixth man who provided instant offense, or just a regular rotation player. After a decent first week in the NBA, however, Fredette’s game flatlined. There are a couple reasons why Fredette has looked like such a bust this season. For starters, he has struggled with his shot, but the bigger problem has been the Sacramento Kings’ decision to play Fredette as a point guard. It’s unclear whether the Kings believe Jimmer belongs at point in the NBA or if they just have no one else to play the position. Of course, Sacramento’s starting point guard is Tyreke Evans, but the shoot-first Evans is anything but a “pure” point guard who looks to set up the offense and create easy shots for his teammates. The Kings’ only other PG is 5-foot-9 Isaiah Thomas, the final pick in last year’s NBA draft. That leaves the team without any good options at point guard, and it’s little surprise they’ve been eager to try Fredette at the position. So how often has Fredette been running the point? According to 82games.com, 37 percent of the Kings’ point guard minutes have gone to him. The problem? He’s been very bad during those minutes, averaging 4.6 assists per 48 minutes and 3.5 turnovers per 48. He commits most of his turnovers in pick-and-roll situations, where Fredette loses the ball 14.8 percent of the time. Fredette has been such an ineffective pick-and-roll ball handler because he doesn’t put much pressure on defenses when he uses ball screens. In college, Fredette was a pretty good playmaker. Defenses frequently chose to double-team him to limit his scoring, and that opened passing lanes for Fredette to find his open teammates. NBA defenders are a big step up from the Mountain West Conference, and Fredette doesn’t attract double teams like he used to. Instead, Fredette has to create his own passing lanes against one-on-one defenders, and he hasn’t yet shown an ability to break down his man and open up the floor. Here’s an example of Fredette’s struggles to create passing lanes. In this play, Fredette decides to reject the screen and attack the rim. A point guard good enough to finish at the basket would be enough of a threat to cause the defense to collapse around him. If that help doesn’t commit, then the point guard scores at the rim. But Fredette lacks the athletic ability to finish over help defenders. In this case he sees Chris Andersen rotating over, so he throws a bounce pass to Corey Brewer. The problem is that Brewer plays for the Denver Nuggets, not the Kings. Perhaps the Kings play Fredette so much at the point because he can’t defend NBA shooting guards. According to 82games.com, Fredette plays 11 percent of the Kings’ total shooting guard minutes, and opposing players average 26.3 points per 48 minutes against him there. Since he hasn’t been making up for his defense by scoring effectively, there’s no reason to have Fredette on the court. 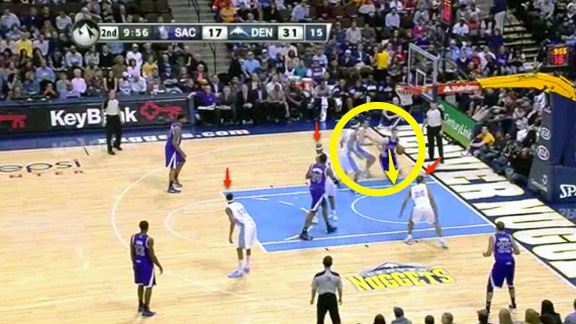 Fredette’s pick-and-roll defense is a glaring issue. He was such an overwhelming scorer in college that his teams rarely asked him to commit to defense, so Fredette hasn’t learned good habits. Usually, he is also a step slower and a couple inches shorter than the players he guards, and Fredette’s attempts to make up for his athletic deficiencies leads to poor defensive technique. In the first clip, Fredette sees the screen coming and he jumps over the top of it to force Mike Conley to reject it. This is a decent strategy, but Fredette executes it poorly. He jumps to the high side of the screen too early, mainly because if he waits any longer he won’t be able to beat Conley to the spot and force him away from the screen. But because Fredette jumps the screen so early, the screener has time to turn around and set another screen on the opposite side. Fredette is now completely out of position. He gets screened and he has no chance to get back into the play. Conley scores on an easy pull-up in the lane. In these clips, Fredette lacks the quickness to fight over screens and get back in front of his man. This forces Sacramento’s big men to hedge and show longer than they want to, and opposing ball handlers take advantage of the resulting size mismatches and inconsistent rotations. Even when Fredette goes under screens, as he does against Ricky Rubio in one of the clips, Fredette struggles to stay in front of his man. Going under is probably the best way to defend a player like Rubio, but if Fredette is too slow to get under the screen and beat Rubio to the other side, it’s a lost cause. Fredette also struggles when trying to stop other guards one-on-one on the perimeter. Opposing teams know this, and they attack him with quick ball handlers. When players isolate against Fredette they are looking to exploit his lack of athletic ability. So far in his career, he hasn’t been quick enough to stay in front of his man on a consistent basis. It hasn’t only been lightning-quick guys like Roddy Beaubois who blow by Fredette; it’s been fast but not exceptionally speedy guards like George Hill. That’s why Fredette can’t guard NBA shooting guards. Most of them are good enough shooters that you can’t give them an extra step as a cushion, but that’s the only way Fredette can hope to stay in front of them. His best hope on defense is to play off his man and hope he misses a long jumper. That’s not good defense. Few scouts expected Fredette to be a good or even decent defender, especially this early in his career, so his struggles on that end aren’t so surprising. More mystifying is the fact that Fredette has played just as poorly as a shooting guard on offense. This is because Fredette hasn’t done a good job of moving without the ball and getting open off screens. When Fredette comes off screens away from the ball, he averages just 0.636 points per possession. That puts him in the bottom 20 percent of all NBA players. He’s shooting 16.7 percent and committing turnovers 27.3 percent of the time. Since Fredette is a great shooter, people might expect him to be a better offensive threat when he works off screens. But moving with the ball and shooting the ball are two separate talents. Getting open off screens requires a lot of technique, and Fredette doesn’t really understand the art of moving without the ball yet. The first rule of using screens is to set them up. A player can use a stop-and-go hesitation, he can push off slightly against his defender, or he can fake one direction and then run the other way. All these techniques, when used at the right moment, provide that extra inch of separation that means the difference between getting a clean shot off and getting blocked. Think about how Ray Allen and Rip Hamilton use screens. You can get dizzy watching them, let alone trying to defend them. When Fredette moves without the ball, he runs in straight lines, rarely changes his pace, and almost never creates contact with his defender. This allows his defenders to “lock and trail” him, so when Fredette receives a pass the defense is already smothering him. With the defense too close for a catch-and-shoot, Fredette is forced to create a shot using his dribble. Once that happens, the defense has already won — they’ve forced Fredette away from his strength, which is shooting, and right back to his weakness, which is creating his own shot with the dribble. Fredette shoots 53.3 percent in catch-and-shoot situations and 32.3 percent off the dribble, according to Synergy Sports. This stat shows how important it is for Fredette to use screens effectively, so he can create the space he needs to catch and shoot. Fredette probably hasn’t learned to move without the ball because he almost never did it in college. Fredette worked off screens away from the basketball just 6.2 percent of the time during his senior season at Brigham Young. Rip Hamilton didn’t become a great off-the-ball cutter by doing it so infrequently. Despite Fredette’s abysmal offensive numbers and the embarrassing video clips of his defense, he might be close to turning his season around. In his last three games, Fredette found his scoring touch, averaging 17.3 points on 48.4 percent shooting, including 61.1 percent shooting behind the 3-point line. The surprising thing about Fredette’s success is that the Kings haven’t really adjusted much to help him succeed. Coach Keith Smart is still having him work off ball screens. However, there is one significant difference between the ball screens Fredette has been using in the past two games and the ones he used the rest of the season. Now, the Kings are setting more screens for Fredette on the side of the court and not at the top of the 3-point line. Sacramento has been pairing him with another primary ball handler like Evans or Thomas and passing to Fredette on the wing. Fredette is better at using ball screens on the wing because he’s a threat to shoot as soon as he comes off the screen. In this possession, being in a threat position allows Fredette to simply rise up and knock down a 3-pointer. He struggled to put pressure on defenses when he came off high screens, but it’s easier to create that pressure from the wing because Fredette is always within shooting range. If he keeps using side screens, Fredette should become a more efficient offensive player. There’s no question that Jimmer Fredette is struggling in his rookie season with the Kings. It’s too early, however, to write him off as another Adam Morrison. If he keeps playing well on the wing and learns to use screens away from the ball, he can still become the scorer Kings fans hoped he would be. The Sacramento coaching staff should be showing Fredette tape of Hamilton, Reggie Miller, and Allen, and getting him as many practice reps as possible to teach him to read defenses and move without the ball. If that happens, we could be seeing Jimmer Time on an NBA court some day. Which All-Star Will Daniel Alfredsson and Zdeno Chara Humiliate Tonight?